Note: International press release. This is a 1:1 copy of the original issued by BMW Group headquarters in Germany. No adaptations have been made to cater for the Australian market. First design model of the current MINI generation; available as a MINI 3 door and MINI 5 door; new MINI Seven as an expression of premium characteristics and individual style with exclusive exterior and interior design features as well as high- end equipment options. New MINI Seven underscores the distinctive character, British origins and tradition- steeped vehicle concept of the original in the premium segment of small cars; named after the Austin Seven, the model with which production of the classic Mini began in 1959. Market launch of the design model with four engine variants as the MINI Seven 3 door (combined fuel consumption: 5.7 – 3.5 l/100 km; combined CO2 emissions: 133 – 92 g/km) and the MINI Seven 5 door (combined fuel consumption: 5.9 – 3.6 l/100 km; combined CO2 emissions: 136 – 95 g/km); output range from 85 kW/116 hp to 141 kW/192 hp. Specific exterior design: MINI Yours body finish in the variant Lapisluxury Blue; three alternative paint finishes to choose from; roof and exterior mirror caps in Melting Silver; 17-inch light alloy wheels in exclusive MINI Seven Spoke two-tone design; MINI Seven door sill finishers; side scuttles with MINI Seven logo; bonnet stripes in Melting Silver with surrounds in Malt Brown available as an exclusive option. Exclusive interior ambience with seats in fabric/leather finish Diamond Malt Brown, interior surfaces in Piano Black, optional Colour Line Malt Brown and MINI Seven logo on the central instrument surround. Additional emphasis of the design model’s exclusive character with optional equipment package MINI Seven Chili; extension of the range of equipment features to include LED headlights, LED fog lamps, white direction indicators, automatic air conditioning, on-board computer, MINI Driving Modes, MINI Excitement Package, sports leather steering wheel with multifunction buttons, rain sensor with automatic driving lights control, seat height adjustment on the passenger side, storage package, floor mats in velours and lighting package. Design model MINI Seven in two body variants and with harmonised character; new MINI 3 door as a modern interpretation of the classic principle of the creative use of space with the highest level of space and ride comfort ever achieved in this model; new MINI 5 door as an innovative vehicle concept with wheelbase extended by 72 millimetres, third seat at the rear and outstanding figures within the small car premium segment in terms of legroom, headroom and luggage compartment volume. Hallmark brand go-kart feeling due to high-quality suspension technology with model-specific suspension set-up in each case; optional sports suspension and Dynamic Camper Control; body and suspension in weight-optimised design and with optimised stiffness for agile and secure driving properties. Full range of occupant protection features based on integrated safety concept and standard equipment including six airbags, 3-point automatic belts, ISOFIX child seat mountings and tyre pressure display for each individual wheel; increased efficiency due to engines and transmissions of the latest generation, extensive range of standard MINIMALISM Technology and optimised aerodynamic properties. Modern display and operating concept with dashboard on the steering column as well as central instrument with extended display elements and optional illuminated LED ring; control of navigation, entertainment, telephone and vehicle functions via optional colour display up to 8.8 inches in size and MINI Controller in the centre console. High-end options to enhance driving fun, comfort and individual flair including LED headlights, LED fog lamps, MINI Driving Modes, MINI Excitement Package, Comfort Access, electrically operated glass roof, 2-zone automatic air conditioning, Radio MINI Visual Boost, MINI navigation system and Wired equipment package including navigation system Professional with MINI Touch Controller. Extensive range of driver assistance systems: MINI Head-Up-Display, Parking Assistant, rear view camera and Driving Assistant with camera-based active cruise control, collision and pedestrian warning with initial brake function, high beam assistant and road sign detection. Current MINI Connected in-car infotainment program; the latest MINI Connected App including MINI Streetwise, online search, Sports Instruments and Force Meter; online-based use of social networks and entertainment features using the vehicle operating system; MINI Connected XL Journey Mate with real-time traffic radar; Intelligent Emergency Call and TeleServices via a SIM card permanently installed in the vehicle. CO2 emissions*: 136 – 133 g/km (126 – 123 g/km) / 139 – 136 g/km (128 – 125 g/km), exhaust emission standard: EU6. CO2 emissions*: 107 – 105 g/km (112 – 109 g/km) / 111 – 109 g/km (114 – 111 g/km), exhaust emission standard: EU6. CO2 emissions*: 109 – 106 g/km (107 – 104 g/km) / 112 – 109 g/km (109 – 107 g/km), exhaust emission standard: EU6. 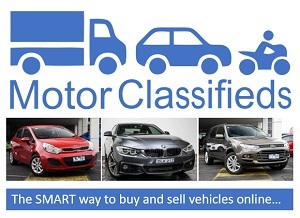 CO2 emissions*: 95 – 92 g/km (99 – 98 g/km) / 97 – 95 g/km (102 – 99 g/km), exhaust emission standard: EU6. * EU test cycle figures, fuel consumption dependent on the selected tyre format. A sense of individual style has always been an integral part of the unmistakable MINI feeling. With the new MINI Seven, the British brand now goes even further in showcasing the distinctive qualities of the original in the small car segment. The first design model of the latest MINI generation presents a particularly striking combination of the brand’s traditional values and the progressive product quality of the current models. Exclusive design features on the exterior and interior underscore the British origins, hallmark driving fun, premium character and extrovert appeal that make the new MINI Seven a more exceptional phenomenon in urban traffic than ever before. 85 kW/116 hp to 141 kW/192 hp. The naming of the new design model recalls the premiere of the revolutionary British small car more than five and a half decades ago. In August 1959, the virtually identical models Austin Seven and Morris Mini Minor were presented to the public for the first time. The first specimen of the legendary 4-seater created by designer Alec Issigonis and known today as the classic Mini came off the production line as the Austin Seven. Featuring front-wheel drive, an engine mounted transversely at the front, short overhangs and a wide track, the Mini offered an unusually generous amount of space for passengers and luggage within a minimum surface area – with a fascinatingly agile driving response to boot. The current MINI model generation embodies the very latest version of this principle of making the smartest possible use of the space available. Not only does it meet contemporary standards in terms of comfort, safety and functionality, it also offers a whole new level of driving fun and refined premium characteristics in terms of design, material selection and finish quality. The classic body concept is once again represented by the new MINI 3 door. A re- interpretation of traditional design features gives it an unmistakable appearance. In the interior – likewise designed in hallmark brand style – there are four seats and a 211-litre luggage compartment. Thanks to its high-quality drive and suspension technology, typical MINI go-kart feeling is combined with exemplary efficiency and optimised ride comfort. The original in the small car premium segment is also geared towards the extended requirements of modern target groups with an innovative body concept. In the current generation, MINI is also represented in the small car category for the first time with a 5-door model. Featuring a wheelbase extended by 72 millimetres, two additional doors, a third seat at the rear and the largest luggage compartment in its class with a volume of 278 litres, the new MINI 5 door provides a whole new range of options to enjoy the driving fun that is so typical of the brand. The new MINI Seven: stylish and expressive exterior design. The exterior design features compiled exclusively for the new MINI Seven are geared towards achieving a particularly stylish and striking expression of the MINI 3 door and MINI 5 door appearance, complete with its characteristic proportions, surface design and lines. 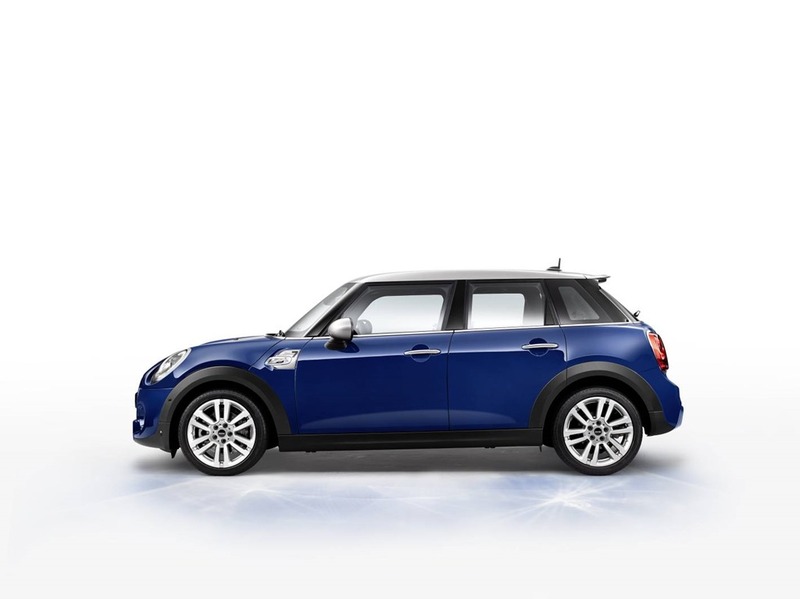 Instantly fascinating appeal is created especially by means of a body finish in the MINI Yours colour Lapisluxury Blue. This non-metallic finish is the most intensive blue tone ever applied to the body of a MINI. The paint finished conceived for the exclusive equipment program MINI Yours is based on the colour Ultramarine, which is regarded as the “blue of kings” and was originally produced by adding fine pigment traces of the semi-precious stone lapis lazuli. The MINI Yours paint finish Lapisluxury Blue derives its striking brilliance, intensity and depth from the highly elaborate and technologically sophisticated production processes by which the paint and protective layers are applied to the body surfaces. There are three other body finishes available to choose from for the new MINI Seven as alternatives to Lapisluxury Blue. The non-metallic finish Pepper White and the variants Midnight Black metallic and British Racing Green metallic are three of the classic options within the MINI colour range in which the characteristic interplay of lines and surfaces on the exterior is given stylish yet discreet emphasis. This also brings out the athletic stature of both the new MINI 3 door and the new MINI 5 door. It is especially defined by the powerfully arched bonnet and the large air inlets in the front apron, the dynamic wedge shape of the side window graphic and a striking sill line that combines with the parallel character line to direct attention to the large wheel arches. The fact that the width of the rear increases towards the bottom likewise contributes to the image of a body sitting powerfully on top of wheels. 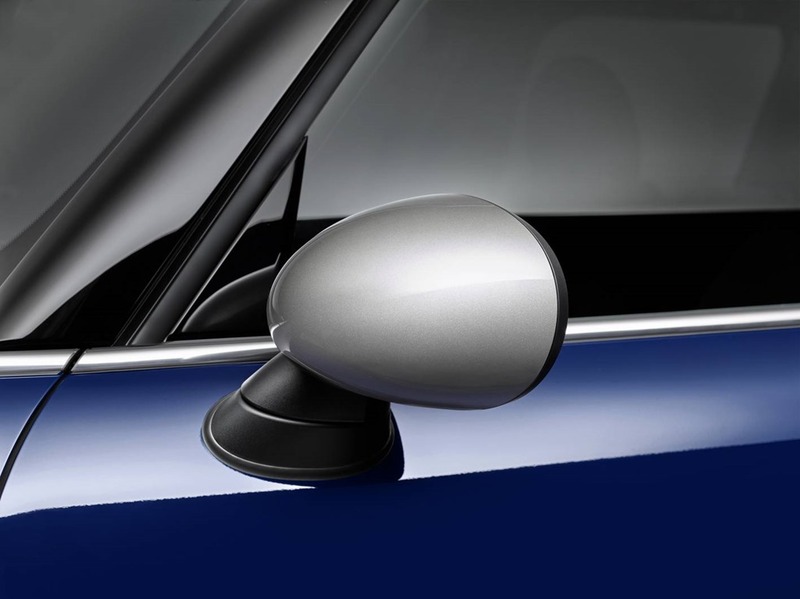 Regardless of the selected body colour, the roof and exterior mirror caps of the new MINI Seven are finished in Melting Silver. This contrasting colour available exclusively for the design model underscores the horizontal body structuring typical of MINI, taking in the corpus, glass sections of the passenger cell and roof. The exclusive bonnet stripes of the new MINI Seven are designed to harmonise with the colouring of the roof and exterior mirror caps. The deco elements, also in Melting Silver, each feature a surround in the colour Malt Brown on the outside. high-end impression. 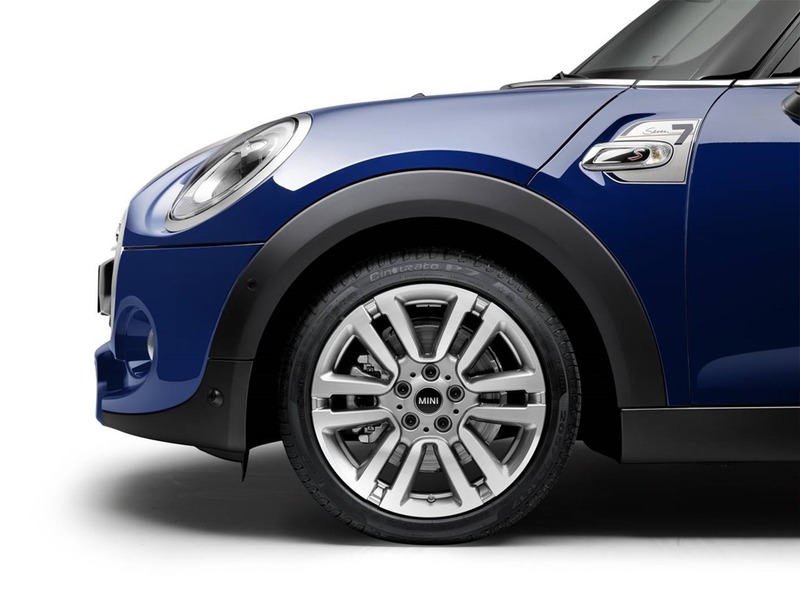 18-inch light-alloy wheels are optionally available for the new MINI Seven in MINI Yours Vanity Spoke two-tone. Both variants of the light alloy wheels perfectly match the exclusive exterior features of the MINI Seven with their burnished surfaces and the MINI Yours paint finish Spectre Grey. Another distinctive accentuation is added by the surrounds of the side indicators on the front wheel arches, known as side scuttles. These bear the logo of the design model which is made up of the wordmark “Seven” and the number seven. 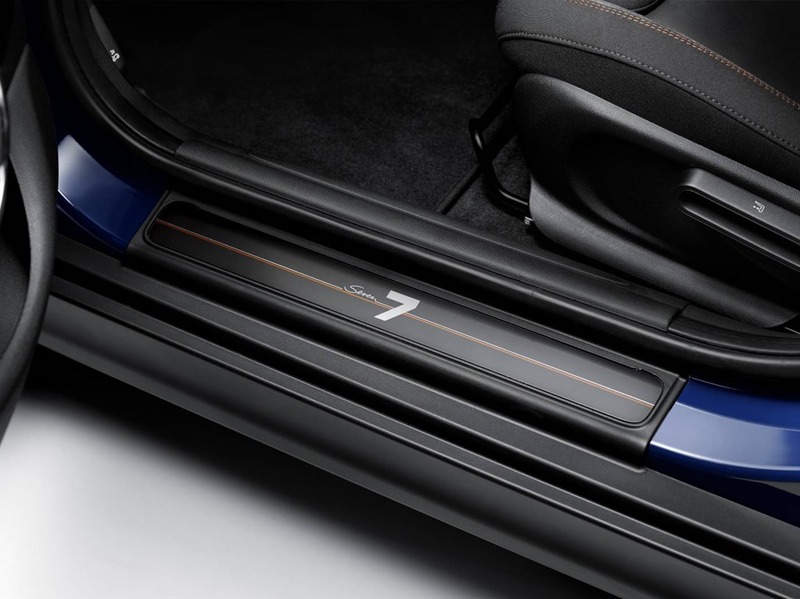 The MINI Seven logo is also to be found on the model-specific door sill finishers on the driver and front passenger side. High-end and harmoniously designed ambience on the inside. 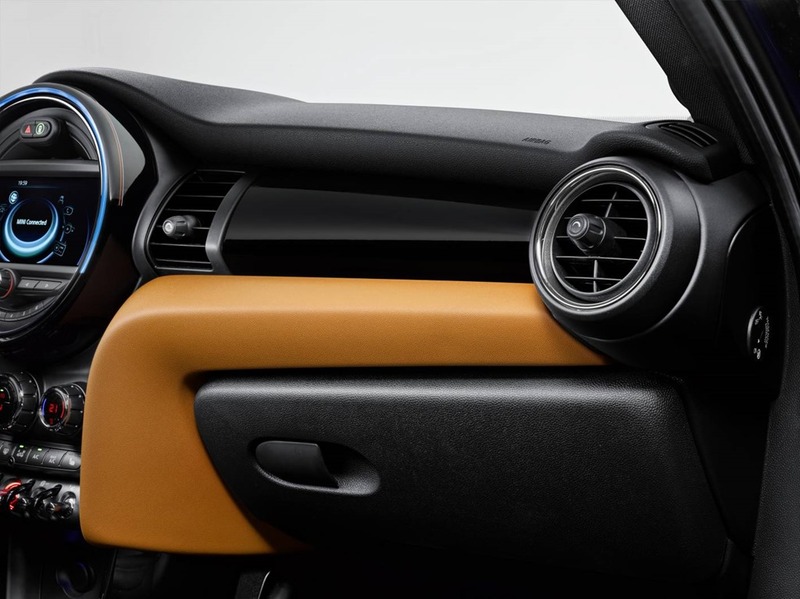 The interior design created for the new MINI generation is defined by three- dimensionally moulded surfaces, high-quality colour and material combinations and a modern display and operating concept. A new interpretation of classic styling is reflected in the horizontal structure of the cockpit and the circular or elliptically shaped contours of key features such as the air vents, instruments and door trim. The central instrument – another characteristic element – offers additional display content. Functionality and ergonomics are optimised by the new dashboard on the steering column and the newly positioned controls. In the new MINI Seven, the mature character and premium ambience of the interior is highlighted by a harmoniously matched selection of colours and materials for the seats and interior surfaces. The standard trim includes sports seats in the exclusive fabric/leather finish Diamond Malt Brown, which was created exclusively for the design model. The black leather of the seat and backrest surfaces is combined with fabric in the side sections. The latter have an oblique grey and black check pattern with a discreetly integrated pinstripe in Malt Brown and seams in the same colour. The variants Cross Punch Carbon Black leather, Lounge Satellite Grey leather and MINI Yours Lounge Carbon Black leather are offered as alternatives. Other features of the design model include the MINI Seven logo on the trim of the central instrument and interior surfaces in the colour Piano Black high gloss. 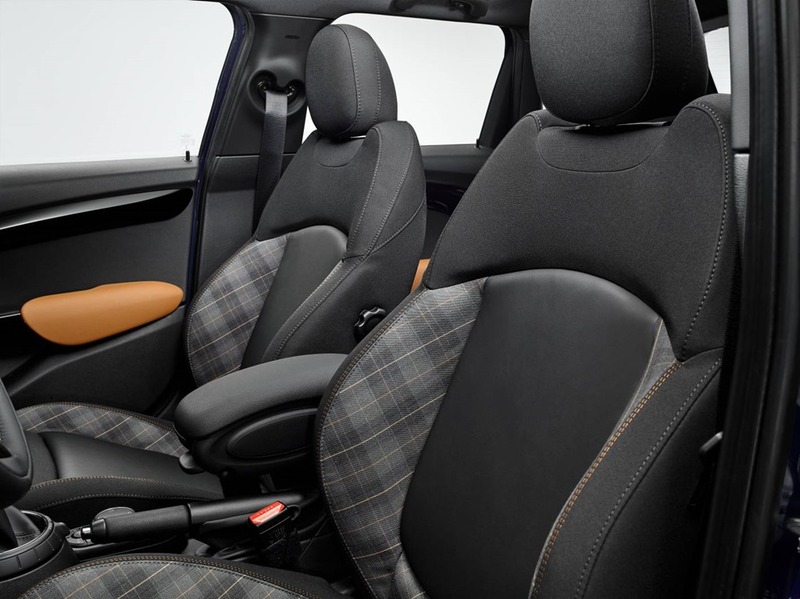 The MINI Yours interior styles Dark Cottonwood, Fibre Alloy and Off-White are optionally available. These options from the MINI Yours program lay the foundation for a particularly stylish and selective customisation that underscores the car’s premium character as well as its British roots. In the MINI Yours interior styles, select materials are combined with a precise finish and high-end design. Another accentuation of stylish individuality derives from the Colour Line applied to a range of elements from the outer air vents to the vertical surrounds of the controls below the central instrument, also including the armrests in the door panels. In the new MINI Seven, the Colour Line comes as standard in Carbon Black, and is optionally available in Malt Brown, a variant exclusively offered for the design model and perfectly harmonised with the other colours used for the interior of the MINI Seven. For exclusive driving fun with an individual touch: the equipment package MINI Seven Chili. The technological progress reflected in the latest change of generation not only gives the new MINI enhanced sporty flair, efficiency and comfort, it has also led to the addition of numerous innovative equipment features that are available in models of the brand for the first time. A selection of especially attractive options is provided by the equipment package MINI Seven Chili, which was compiled exclusively for the design model. 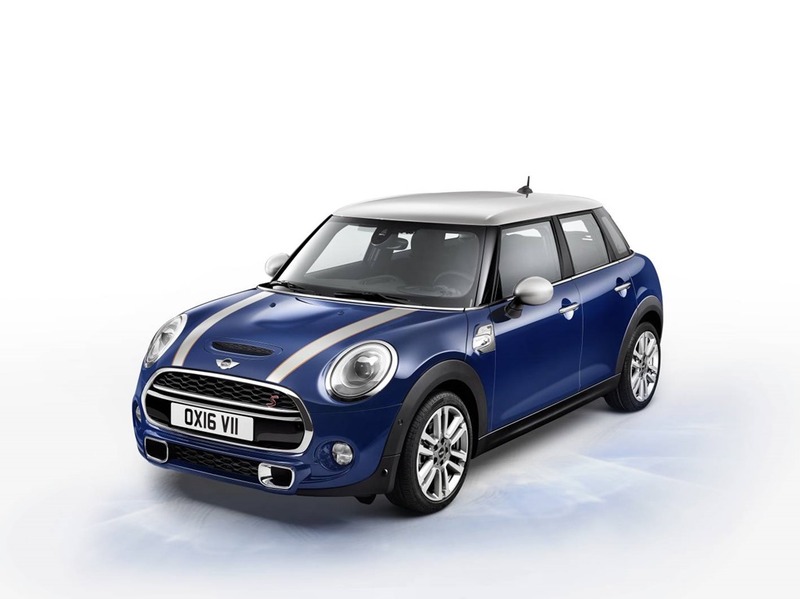 The elements of this package enhance not just the driving fun but also the premium character of the new MINI 3 door and MINI 5 door, and – in combination with the specific exterior and interior look of the design model – create the perfect basis for both exclusive and individual MINI feeling. The particularly progressive elements of the MINI Seven Chili package include LED headlights, a feature that is unique in the small car segment. Their LED units emit bright, white light for both low and high beam, and they are surrounded by an LED daylight driving ring, the lower section of which reaches down to the white turn indicators. The fog lamps and rear lights also feature LED technology. The rain sensor with automatic driving lights control makes an additional contribution to optimum road visibility. The equipment package MINI Seven Chili also comprises a sports leather steering wheel with multifunction buttons, cruise control with brake function, an on-board computer displaying road speed numerically, current and average fuel consumption, remaining range, average speed and tyre pressure control messages, as well as the MINI Driving Modes for individual vehicle set-up. A rotary switch at the base of the gear or selector lever can be used to activate either the standard MID mode, SPORT mode or GREEN mode. The MINI Driving Modes influence the characteristic curves of the accelerator, steering and also – if the car is fitted accordingly – the shift characteristics of the Steptronic transmission and the Dynamic Damper Control program map. Ride comfort and premium interior comfort are enhanced by automatic air conditioning, a height-adjustable front passenger seat, floor mats in velours, the lighting package and the MINI Excitement Package. The lighting package creates a distinctive atmospheric appearance in the dark with LED units for the interior and footwell lighting, the mirrors on the inside of the sun visors, the reading lights and the spotlights directed at the front seats when the doors are opened; there is also orange-coloured ambient lighting for the centre console at front. In addition to this, the MINI Excitement Package comprises ambient lighting with continuously variable colour adjustment function for the footwell, door trim and lower section of the centre console as well as illuminated outside door handles. What is more, an LED ring on the outer rim of the central instrument provides a lighting display which reflects the current driving situation. For example, the needle movements of the road speed and engine speed display in the instrument cluster and changes in the desired temperature are underpinned by simultaneous light impulses in the LED ring. MINI Seven Chili also includes the storage package. This enhances functionality by means of a variable load floor, tilt-adjustable rear backrest and a storage net in the footwell on the front passenger side as well as a 12 volt socket and four lashing eyes in the luggage compartment. Individual style in maximum variety: two body variants, four engine types. The launch of the new MINI 5 door made driving fun in the original of the small car premium segment accessible to additional target groups. 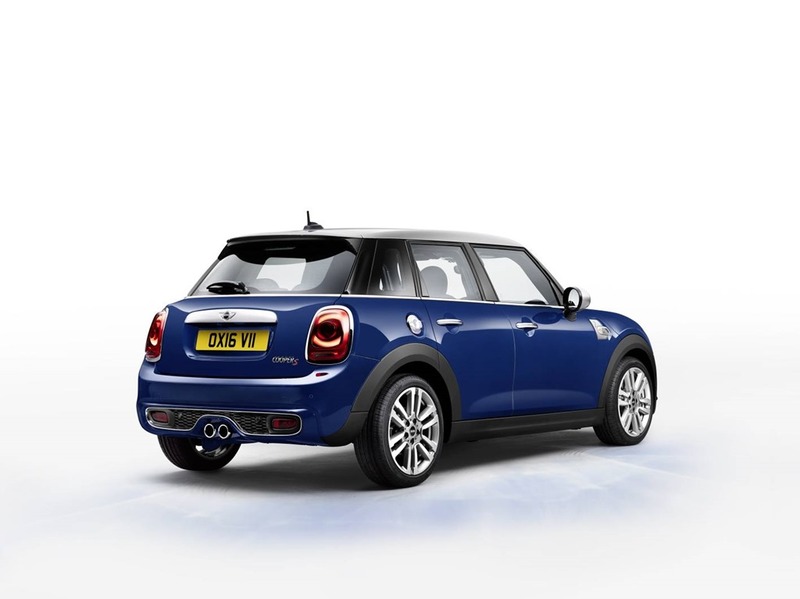 The individual style of the new design comes into its own in both the MINI 3 door and the MINI 5 door. What is more, the new MINI Seven is available in four engine variants for each body type. The latest engine generation with MINI TwinPower Turbo Technology, likewise newly developed transmissions and extensive MINIMALISM Technology help ensure all model variants achieve an exemplary balance between driving fun and fuel consumption. The range of petrol engines includes the 1.5 litre 3-cylinder in the MINI Cooper 3 door with an output of 100 kW/136 hp (combined fuel consumption: 4.6 – 4.5 l/100 km; combined CO2 emissions: 107 – 105 g/km) and in the new MINI Cooper 5 door (combined fuel consumption: 4.8 – 4.7 l/100 km; combined CO2 emissions: 111 – 109 g/km), and the particularly spirited 2.0-litre 4-cylinder engine with an output of 141 kW/192 hp in the MINI Cooper S 3 door (combined fuel consumption: 5.8 – 5.7 l/100 km; combined CO2 emissions: 136 – 133 g/km) and in the MINI Cooper S 5 door (combined fuel consumption: 6.0 – 5.9 l/100 km; combined CO2 emissions: 139 – 136 g/km). There are also two diesel engines: from three cylinders and a capacity of 1.5 litres, the engine of the MINI Cooper D 3 door (combined fuel consumption: 3.6 – 3.5 l/100 km; combined CO2 emissions: 95 – 92 g/km) and the MINI Cooper D 5 door (combined fuel consumption: 3.7 – 3.6 l/100 km; combined CO2 emissions: 97 – 95 g/km) generates an output of 85 kW/116 hp. A 2.0-litre 4-cylinder diesel with an output of 125 kW/170 hp powers the models MINI Cooper SD 3 door (combined fuel consumption: 4.1 – 4.0 l/100 km; combined CO2 emissions: 109 – 106 g/km) and MINI Cooper SD 5 door (combined fuel consumption: 4.3 – 4.1 l/100 km; combined CO2 emissions: 112 to 109 g/km; all EU test cycle figures, dependent on tyre format selected). For all model variants of the new MINI Seven there is the optional alternative of a 6-speed Steptronic transmission instead of the standard 6-speed manual transmission. What is more, the models MINI Cooper S 3 door, MINI Cooper S 5 door, MINI Cooper SD 3 door and MINI Cooper SD 5 door can also be fitted with a 6-speed Steptronic sports transmission which offers even shorter shift times and includes not just a separate gear selector lever but also shift paddles at the steering wheel. Unique in the segment: go-kart feeling combined with a full range of safety features and modern driver assistance systems. Regardless of the engine type selected, high-quality suspension technology extensively refined and adapted for each specific model of the new MINI generation ensures that the power of the new MINI Seven is transformed into enthralling agile driving properties. The hallmark brand go-kart feeling derives from a single-joint spring strut axle at front, a multilink rear axle, electromechanical power steering and highly powerful and precisely controllable brakes – a combination that is unique in the small car segment. Dynamic Damper Control is available optionally and features electrically controlled dampers which can be adjusted via the MINI Driving Modes. The standard DSC (Dynamic Stability Control) also includes DTC (Dynamic Traction Control) mode and Electronic Differential Lock Control (EDLC) – an electronic locking function for the front axle. 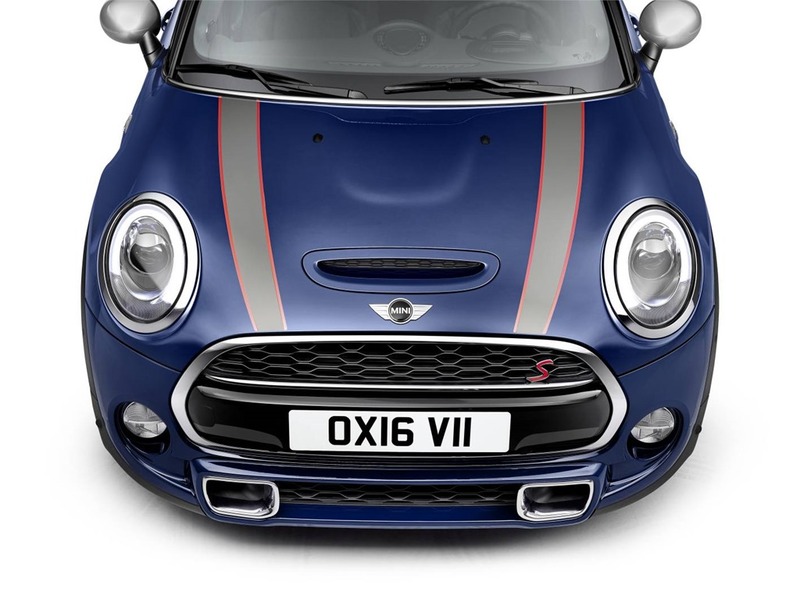 The models MINI Cooper S 3 door, MINI Cooper S 5 door, MINI Cooper SD 3 door and MINI Cooper SD 5 door are also fitted with Performance Control, a system that counters any tendency to understeer prior to reaching the threshold level. The standard trim also includes tyre pressure display for each individual wheel. Exemplary vehicle occupant protection is ensured by the integrated MINI safety concept which includes not just a body with highly resilient bracket structures, optimised deformation zones and an extremely stable passenger cell but also front and side airbags, side curtain airbags, 3-point automatic belts on all seats, belt tensioners and belt force limiters at the front and ISOFIX child seat mountings at the rear as standard. The range of driver assistance systems developed for the new MINI generation includes the MINI Head-Up Display, Parking Assistant and rear view camera and also the Driving Assistant system including camera-based active cruise control, collision and pedestrian warning with initial brake function, high beam assistant, road sign detection. Individually tailored driving fun with high-end options and MINI Connected. 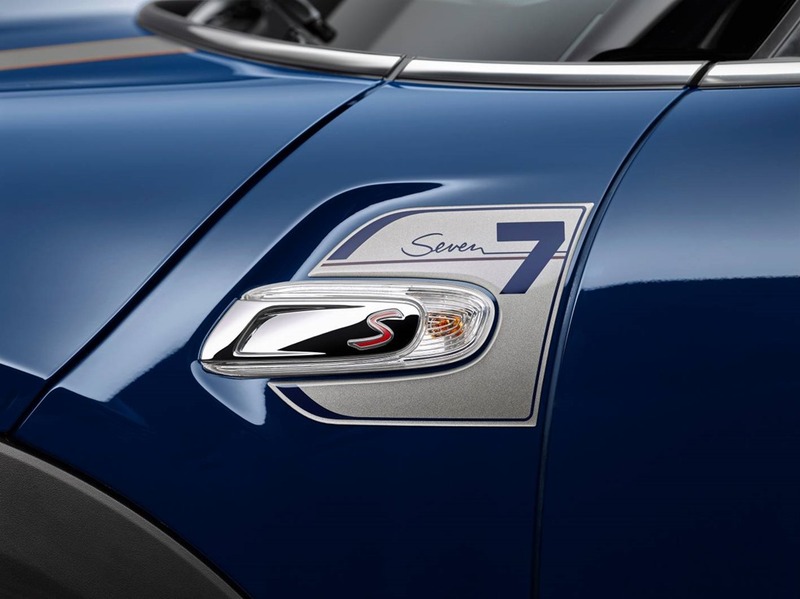 The premium character of the new MINI Seven can be further highlighted not just with the equipment package MINI Seven Chili but also with other individual options. The highlights of the range of individually selectable optional equipment include the seat heating for driver and front passenger, the panorama glass roof, the visibility package include windscreen heating, Comfort Access, the Harmon Kardon hi-fi speaker system, the Chrono Package cockpit with circular instruments for charge-air pressure, oil pressure and stopwatch, Park Distance Control, electrically heated and folding exterior mirrors and both interior and exterior mirrors with automatic dip function. All model variants of the new MINI Seven are fitted as standard with a permanently installed SIM card. This means that Intelligent Emergency Call with automatic detection of vehicle location and accident severity can be used, as well as MINI TeleServices. The special equipment features MINI Connected is also available in conjunction with the optional equipment features Radio MINI Visual Boost, MINI navigation system and MINI navigation system Professional. It offers extensive integration of smartphones in the car, allowing the use of internet-based services in the areas of infotainment, communication and driving experience by means of apps. The MINI Connected XL Journey Mate provides an innovative form of travel planning and support. Operation of all functions is intuitive and reflects hallmark brand style, using the MINI Controller in the centre console and the colour display up to 8.8 inches in size in the central instrument. The new MINI Seven: following in the footsteps of its ancestors in elegant and distinctive style. The new MINI Seven combines stylish individualism and progressive technology with an awareness of brand tradition and the British roots of the original in the premium segment of small cars. The design model follows in the footsteps of the classic Mini, its name echoing the very first appearance of its legendary ancestor more than five and half decades ago in two virtually identical model versions. This first classic Mini ever produced was an Austin Seven. It left the Longbridge plant in Birmingham, UK, on 4 April 1959. The only features distinguishing the Austin Seven from its twin, the Morris Mini Minor, were the radiator grille complete with brand logo, the hub caps and the body paint finish. Tartan Red, Speedwell Blue and Farina Grey were the names of the colours in which the Austin Seven was available. The entire production of the classic MINI was moved to the Austin Seven’s place of origin in 1969. It was at this point that Mini became the standardised brand name for the small car, which by then had gained worldwide popularity. It was not until 31 years later on 4 October 2000 that the last of almost 5.4 million classic Mini came off the production line – also in Longbridge. Belonging to the BMW Group by this time, the brand had launched a special model of the successful small car a short time previously. Its name: Mini Seven. The memory of the first of all classic Mini models was kept alive after the relaunch of the brand in 2001, too. Another edition model bearing the tradition-steeped name was premiered in 2005. The MINI Seven introduced on this occasion was available in three engine variants and featured such elements as newly designed light alloy wheels, white direction indicators and high-end comfort fittings complete with a lighting and storage package as well as exclusive design features for the exterior and interior. Another parallel with the current design model: the MINI Seven of the year 2005 was the first model variant of its generation to feature a roof in the contrasting colour of silver. Helpful hint no. 25: What side is my car’s fuel filler on?